Jumpstart Your College Career: Join Us for FREE Math & English Preparation Classes! Are you an adult interested in college but worried your English and math skills aren’t quite up to par? Join us for an open house info session to learn more about Worker Education at the Murphy Institute’s FREE College Preparation Program! 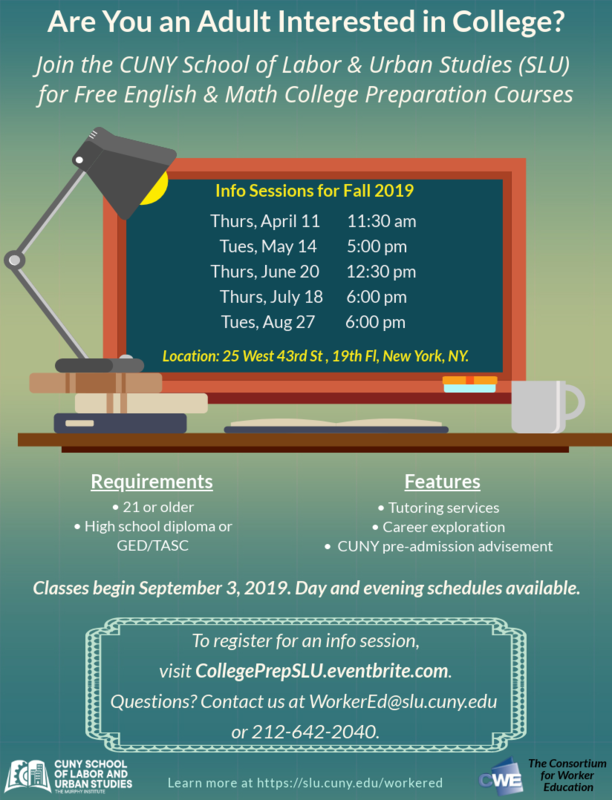 This program, held at the CUNY School of Labor and Urban Studies (SLU) in collaboration with the Consortium for Worker Education (CWE), offers FREE day and evening classes in both Reading/Writing and Elementary Algebra. One-on-one tutoring services, career advisement, and CUNY admission assistance are also provided at no extra cost. Each open house will take place at SLU (25 West 43rd St, 19th floor) and will include information on the program, a meet-and-greet with the instructor, a Q&A, and assessment testing for interested participants. RSVP now by clicking here! Classes begin on September 3rd, 2019 and run through mid-December. Participants must be 21 or older with a high school diploma or high school equivalency to participate. Questions? Feel free to contact us at WorkerEd@slu.cuny.edu or 212-642-2040. Learn more about all of Worker Education’s programs and offerings at slu.cuny.edu/worker-education.